NASA has created something truly out of this world, for a completely out of this world mission many years from now. An incredible new piece of equipment was just unveiled down in Florida by NASA, and it’s a concept that could forever change man’s mission to Mars. The space agency unveiled a Mars rover concept that will serve as an intermediary step toward an actual manned mission to the Red Planet sometime in the next couple of decades. This rover is just a concept, and will never see the surface of Mars, but scientists could incorporate elements from it onto a new rover that may one day carry astronauts across the Martian surface, according to a recent statement from NASA after the rover’s unveiling at the Kennedy Space Center Visitor Complex in Florida. The rover is powered by solar panels as well as a 700-volt battery, and it also features radios and a navigation system powered by a Global Positioning System. It was designed by NASA subject matter experts. “It looks like something out of this world, but that’s exactly where it would work,” NASA said in a statement. 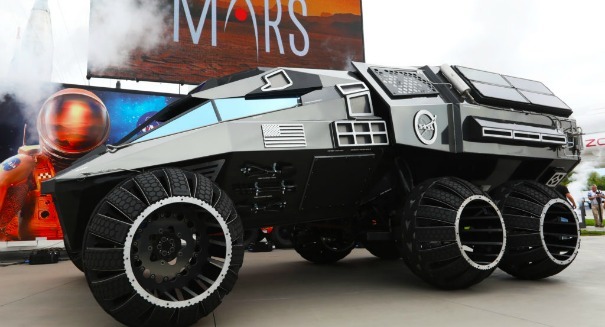 “A futuristic Mars rover concept vehicle was recently unveiled at the Kennedy Space Center Visitor Complex with a goal of inspiration and education as NASA continues developing plans for its journey to the Red Planet. Once ANY portion of the system/hardware reliability factor falls below 100 %, the Logistics trail of maintability and supportability exponentially increases. I am referring to… training (Operator, maintenance) for ALL support personnel. Consider the training, tech manual development, tools, spares and repair parts, containers, all onboard and ground support equipment, and the .space needed for repair to be accomplished. The farther the reliability drops below 100%, the greater the logistics tail/trail, cost and complexity increase. Logistics = a function of reliability and supportability. !